Built in 1933, the majestic Clifford Pier Building was a landing point for immigrants and other passengers who arrived in Singapore by sea. 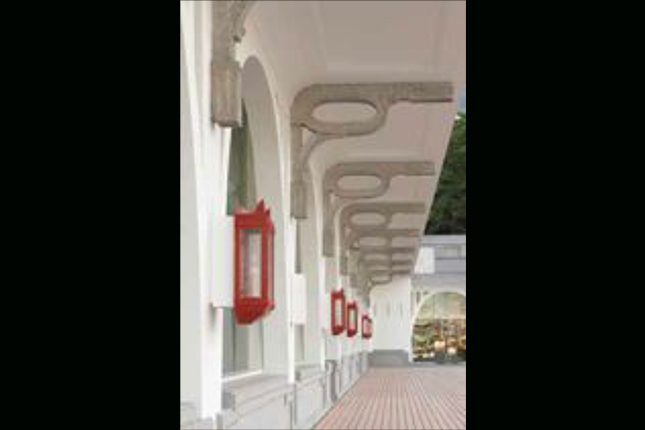 As red oil lamps used to hang from the pier to guide seafarers, it was widely and affectionately known in Chinese as ‘Red Lamp Pier’ (红灯码头). 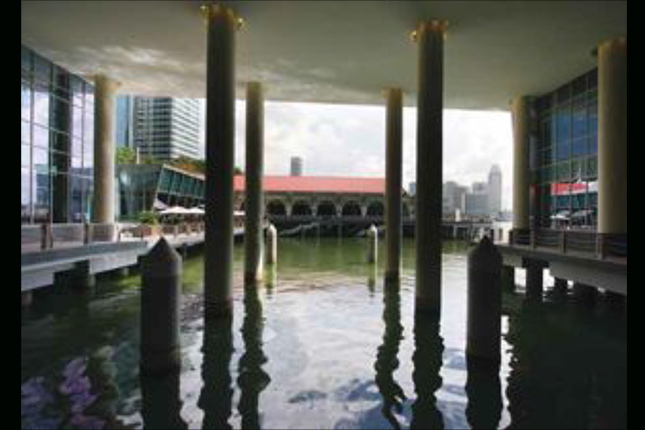 The two-storey Customs House, constructed in the late 1960s, was one of Singapore’s earliest public buildings built in the simple and functional ‘Modern’ style. It was home to the Singapore Customs Police, which was responsible for watching over one of the world’s busiest harbours as Singapore’s trade and shipping thrived from the 1960s onwards. The Fullerton Heritage project involved the conservation and transformation of the Clifford Pier Building and Customs House, and the building of a new six-storey hotel nestled between the two historical buildings. The Clifford Pier Building had a simple but unique architecture. The star architectural treasures of the building include the roof structure with its signature concrete arched trusses, and the stained glass fanlight at the main entrance in varying shades of blue. 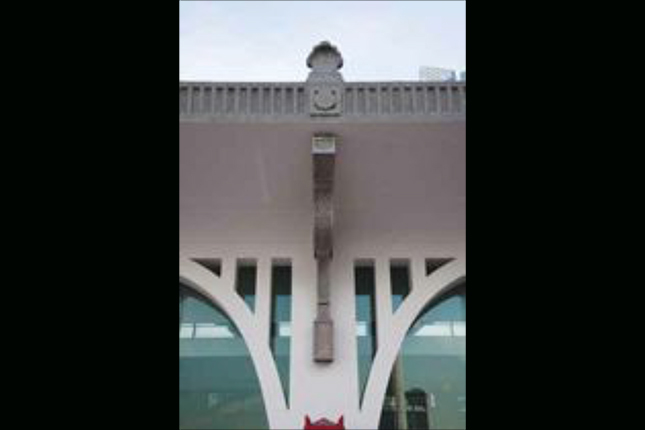 Many other details such as the roof support brackets and even the cast iron rain water down pipes are also unique features of this building. Many of these unique elements have been expertly preserved and brought back to life by the restoration project team. During restoration, it was discovered that some of the building’s most distinctive architectural features, such as its roof support brackets, had their original shanghai plaster finishes concealed under layers of paint – probably applied over the years to prevent deterioration. Instead of simply re-applying paint, the project team decided to expose the beauty of the original shanghai plaster finishes. However, as some of the shanghai plaster finishes were in poor condition, they had to be restored with matching materials and colours. Other key characteristics of the building have also been retained. For instance, most of its façade and exterior parapet are made up of grey granolithic finishes, carefully selected to match with the original texture and grain-sizes. Also, even though the original asbestos roof panes had to be replaced as they were hazardous to health, the final aluminium roof tiles retained the qualities of the original and the selected terracotta brown colour aimed to reinstate the roof to its original colour. In addition, many decorative accessories were preserved, restored and displayed as artefacts within the Clifford Pier Building. These include the cast-iron red lamps and lanterns, which were restored to their original red colour, and are now located prominently in various parts of the building. The Clifford Pier was formerly open on all sides and naturally ventilated. The greatest challenge in transforming this voluminous structure was thus to introduce within it an air-conditioned environment appropriate for its new use: a high-end luxurious hotel with a fine-dining restaurant. In restoring Customs House, a critical design issue was to adapt the former office building to one that houses dining establishments, while retaining its ‘original spirit’. There was also the added challenge of connecting the building to the rest of the waterfront development. The building was successfully reconfigured and reinvented by the project team. The butterfly fascia boards on its façade are original conserved features. New modern glass shop-fronts were sensitively added to its first storey such that the old and the new blend together harmoniously. Of notable mention is the retention and restoration of the building’s square umbrella-like pavilions. To preserve its rich maritime heritage, only basic repair works were performed on the watchtower. The original windows were cleaned and repainted. The original handrail leading up to the top of the tower, however, was in a state of disrepair. It was replaced with an identical custom-made handrail. 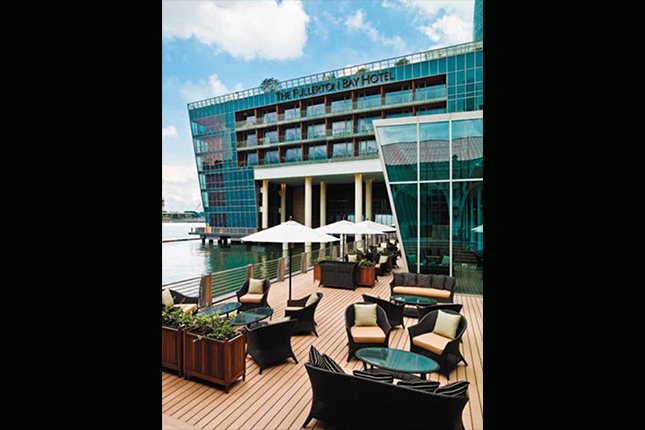 Nestled between two historical buildings is The Fullerton Bay Hotel. This new six-storey hotel pays tribute to its unique context by inclining three sides of its glass façade to capture the reflections of the two heritage buildings, and at the same time presenting a sleek and modern look. 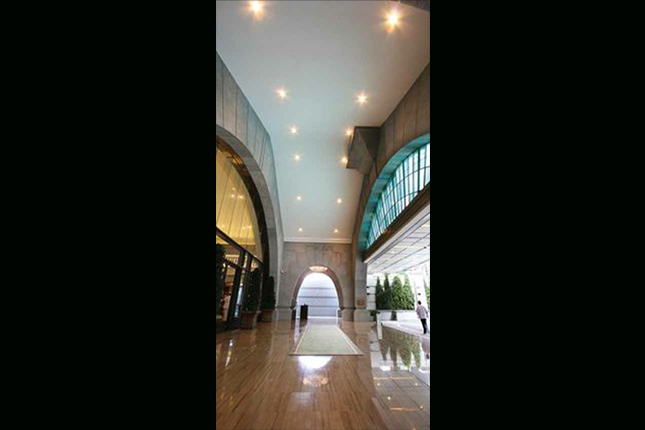 The hotel’s main entrance is located at the Clifford Pier Building. 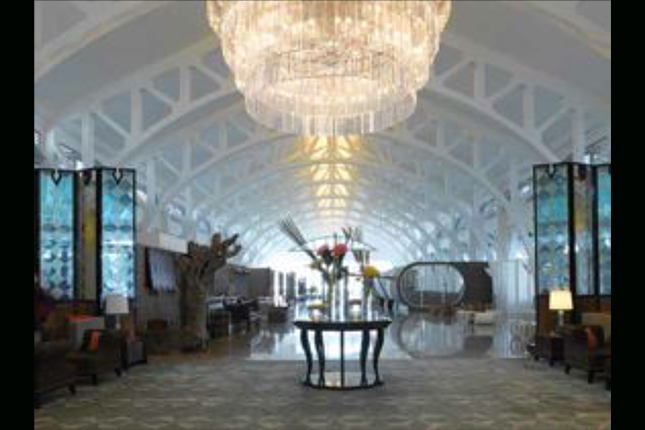 A brief journey brings hotel guests from the past to the present, starting from the historic Clifford Pier, slowly transiting to a modern link-way with a hotel lounge offering glorious views of the Marina Bay, and finally to the main hotel building where the reception greets the guests. 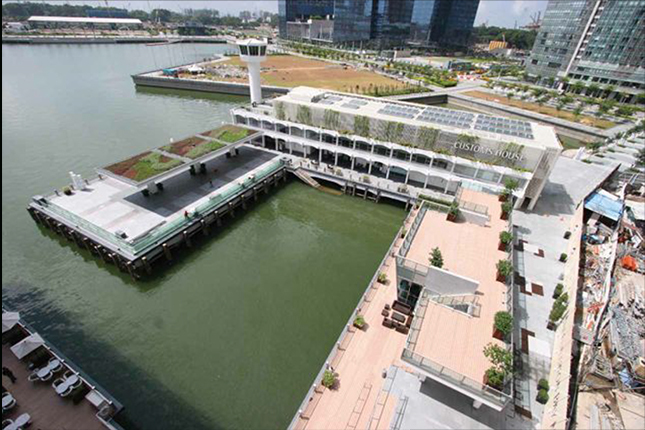 The revitalised historic waterfront now serves as an attractive lifestyle destination in the Marina Bay area, and the tastefully preserved Fullerton Heritage was one of the Category B winners of the 2011 Urban Redevelopment Authority (URA) Architectural Heritage Award.